Trinity Designs: Stampin' Up! Regionals - VA Beach! Happy Monday everyone! I had such a fun weekend - so much fun that I have done THREE posts today to contain it all! LOL! As you can see from this first one, I did a bit of socializing on Saturday - really more socializing than stamping - but just ask any of my friends and they will say that's always how it is with me! Thank goodness they still love me even though I talk so much! The first pic is with Shelli Gardner. I know I've told you before how warm and welcoming she is, but it bears repeating. Stampin' Up! is the fabulous company it is because of the heart of our leader. Shelli takes time to chat with us and puts up with a zillion pictures. I had the priviledge of speaking with her for a minute and for those of you who have been reading her blog, she said her Dad is still recovering nicely from his accident. This next picture is with Shannon West. 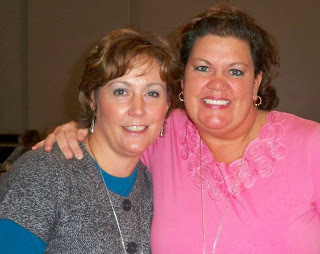 Shannon is part of the fabulousness of Stampin' Up! and I was so happy to meet her after hearing Karah speak so highly of her. She is just as sweet as her smile and I hope she was able to get the ice cream we talked about! Hi Shannon! Raising my Diet Coke to you now! 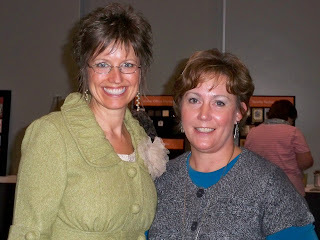 Shannon was one of our presenters and I got some amazing ideas from her that I'll be sharing here in the future. 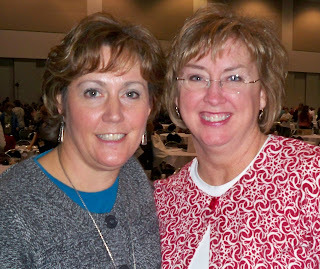 Next is a picture with Donna Griffith, also someone I love at Stampin' Up! corporate. She was so supportive this past summer when I was a convention speaker and just made me feel very special. The shoe was on the other foot this time, as she was one of our presenters also. Donna had been behind the scenes for a number of years but did a WONDERFUL job with her spots! Did you hear me Donna? I LOVED it and you did so great! Last, but not least are a couple of photos with some demo friends. 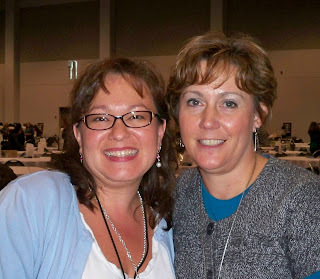 Both Debbie Naylor ( in the first photo) and Lisa Freeman (in the 2nd photo) were with me at Founder's Circle this year and it was great to get to know them there. They are both so sweet and I'm lucky to be able to call them friend! I just love seeing all your pictures from Regionals!!! I so wish I could have been there with you!!!! Looks like you had a great time!! Hi Robin! Thanks for sending me the pics--I'm going to put this one of us on my blog too (when I get around to it--I'm a lazy blogger lately! haha). It was so great to meet you! Didn't find the ice cream place. Boooo! It was so great to meet you finally! looks like it was good times had by all. Hey Robin! WOW looks like you had a blast at Regionals! 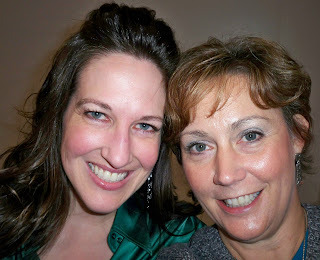 The photos of you with Shelli, and Shannon are gorgeous!!!! I know Shannon quite well from when she has come down to Australia..she is just a sweetheart. I hope you had a blast!